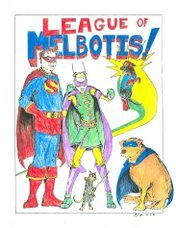 Melbotis's post-op recovery goes apace. He has a big square shaved into his side, about 7" x 7", and his big old scar and stitches sit in the middle. We can't really bandage him, but in an effort to keep him clean, we've asked Mel to put on a shirt. Now he looks like a little man. Yes, next to The League, everything looks a little smaller. Here is the plate of brownies Jamie made for me on my birthday. I forgot to post this after my birthday. As last evening was our anniversary, Jamie and I went to Primo, this odd little italian restaurant a few miles from us. The place is in a strip shopping center near a Taco Bell and a bagel shop, but it has decided that a mediocre location and an oddly spartan interior are no reason they can't have really darn good food. For some reason, probably the white tablecloths and waitstaff in white-shirt and tie, most of the patrons have decided that you have to dress up a bit to go to Primo. Part of that pressure may also come from the fact that 80% of their patrons are from Sun City (the 50 and over community south of us), and this is their big night out for the week. So, heck yeah, these folks put on something a little snazzy. That, of course, isn't the norm in Arizona. Most places are more like Chili's, where if you have a diaper and scuba fins on, you can get a table. Some people show up in their t-shirts and shorts, look around for a beat, then head to Taco Bell. Others don't seem to notice, and Ziggy (the owner) doesn't really have a real dress code. If he did, the first time we showed up in t-shirts and shorts, we never would have made it in the door. What I always wonder is what the families like this do when they sit down and see the menu is not pizza, grinders and spaghetti out of a can. They don't ever get up and leave, so they must be figuring something out. Anyway, Jamie has a new dress she got for her birthday, so she wore it to dinner. She looked lovely. I looked awful. And as I had to come home early to jump-start Jamie's car, I never even got a chance to get her anniversary flowers. Ah, well. There's always next year. As some of you may know, Chad Hedrick won the gold medal in Olympic Speed Skating a few months back. He's originally from the same general area of Houston where The League went to high school and where The Admiral and The KareBear still dwell. Chad's aunt teaches at the same school where The KareBear works, and for some time they've been trying to get Chad to pop in and give a "follow your dreams" speech. Unfortunately for poor Chad, he also works out occasionally at the gym where the KareBear chisels herself into a menacing teaching machine and guilt dispenser. Now, the KareBear is in awe of Olympians and all that, but she's also mostly interested in her class of kids and getting them inspired. So, The KareBear, not sure what this term "boundaries" means, apparently bugged Chad at the gym (using her patented guilting technique that has never quit working on The League) until he came to Kaiser Elementary and gave his "chase your dreams" speech. Oh, and apparently my Mom's school put her up in a hot air ballon yesterday. So now she wants to take Jamie up in a hot air balloon. Not sure what that's all about. The NFL Draft is upon us. The League was delighted, but not surprised, that Vince Young was in the top five picks. We're even more excited that he went to The Titans. That's a good spot for him to grow, as long as McNair hangs around to make sure VY keeps his head screwed on straight. Reggie Bush went a surprising second. Some guy I'd barely heard of went first, with the Texans picking Mario Williams out of NCState. Reggie will be playing for The Saints. Let us all hope Reggie makes wiser decisions that Ricki. Matt "I Look Like a Future 'The Bachelor' Contestant" Leinart wound up in AZ, which is probably great news for Leinart. Leinart, no doubt, is completely unaware that folks in Phoenix pay more attention to USC football than UA or ASU football. This guy is going to have a massive built-in fan base the second his feet hit the turf at the new Cardinals stadium in Glendale. I didn't even know Huff had entered the draft from Texas, so I was excited to see him go to Oakland (before Leinart). I'm glad all the debate and speculation can end. The NFL draft is necessary, but it's very boring television (I'd never watched before). Most puzzling is all the hooplah over a bunch of players who have as of yet to prove any of their NFL mettle. Even in the "remember the time..." clips they were using to fill space in the show, there's Berman, ugly and moronic as ever, talking about a bunch of players who showed up in the NFL and pretty much fizzled. If anything, the draft is popular simply because it gives the NFL a chance to be seen on TV when they won't really be doing anything again until August. Speaking of sports and fizzling, my Phoenix Suns are looking like maybe they aren't a play-offs made team this year, losing two of three to the Lakers. Or, more accurately, to Kobe. It's just painful and I can't watch. The Suns just look off, like everybody but Nash thinks they don't belong there. Meanwhile, the Lakers look brisk and confident. Oh, and the Cavs squeaked one out last night, thus extending their stay in the paly-offs that much longer. This week The League has two big events lined up. On Thursday we have tickets with pretty good seats to go see the Arizona Diamondbacks meet up with the Cubbies. As The League has as of yet to see a team he's cheering for win a baseball game (could be something to do with seeing mid-90's 'Stros and then The Cubbies) I've decided to cheer for the D-Backs in hopes that the Cubbies win. I'm trying to learn the names of the different D-Backs pitchers, but we haven't been watching enough and I don't know enough about baseball. Our other big scheduled event for this week is to toddle north to see the AZRD bout between the Surly Girlies and the Bad News Beaters. I'll be cheering on the Surly Girlies. But mostly I'll be cheering on Brickhouse. Hope you guys are having a good weekend. I'm off to read some comics.